One of the grandsons of Soviet leader Josef Stalin has been found dead in the Russian capital Moscow, ambulance officials say. The body of Yevgeny Dzhugashvili, 80, was found close to his home in the city. The cause of death is unclear. Mr Dzhugashvili was an outspoken defender of his grandfather's legacy, frequently using the courts to do so. In 2015 he lost a case relating to the 1940 Katyn massacre of Polish prisoners at the European Court of Human Rights. The court rejected a complaint brought by Mr Dzhugashvili over an article accusing the Soviet leader of being a "bloodthirsty cannibal". Published in the Russian newspaper Novaya Gazeta, the article said Soviet leaders including Stalin were "bound by much blood" by ordering the execution of about 20,000 Polish prisoners of war at Katyn. Mr Dzhugashvili argued that the article blackened his grandfather's reputation and was defamatory. He took his case to the European court after various courts in Russia threw it out. He also argued that the Soviet Union would not have gone downhill if his father lived longer. More recently he accused President Putin of being "without brains". Western biographies of Stalin record three children - Yakov by his first wife Ekaterina and a son and a daughter - Vasily and Svetlana - by his second wife Nadezhda. Both sons are dead. Svetlana defected from the Soviet Union in 1966 and died in 2011 in the US. 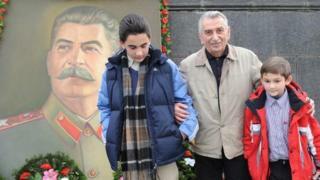 Stalin was thought to have at least eight grandchildren.